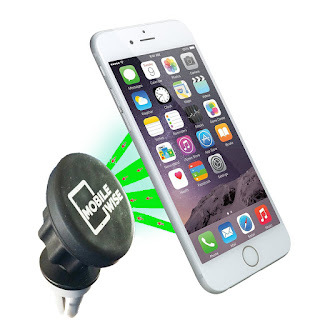 The Mobile Wise Magnetic Air Vent Cell Phone Mount is perfect for mounting your mobile phone safely and smartly in your car. The magnetic mount can quickly & easily fit on vents of almost any car. It is compact and light, so you can carry it in your pocket. It can also be easily detached, meaning that you can use it not only in your car but in any other car with ease. Using this magnetic mount, you can place your cell phone at a position where it is easy to use. Unlike other regular mounts, it doesn't block your view from the front glass and hence doesn't create a distraction during driving. Unlike other mounts, this mount can be rotated 360 degrees allowing you to position your smartphone for viewing in either portrait or landscape mode. The strong magnet for mounting your product ensures that your valuable phone doesn't fall off even on the bumpiest of the rides. The rubber grip that clamps onto the air vent is soft enough to prevent any scratches on the surface of the air vent, yet strong enough to firmly hold onto the air vent. 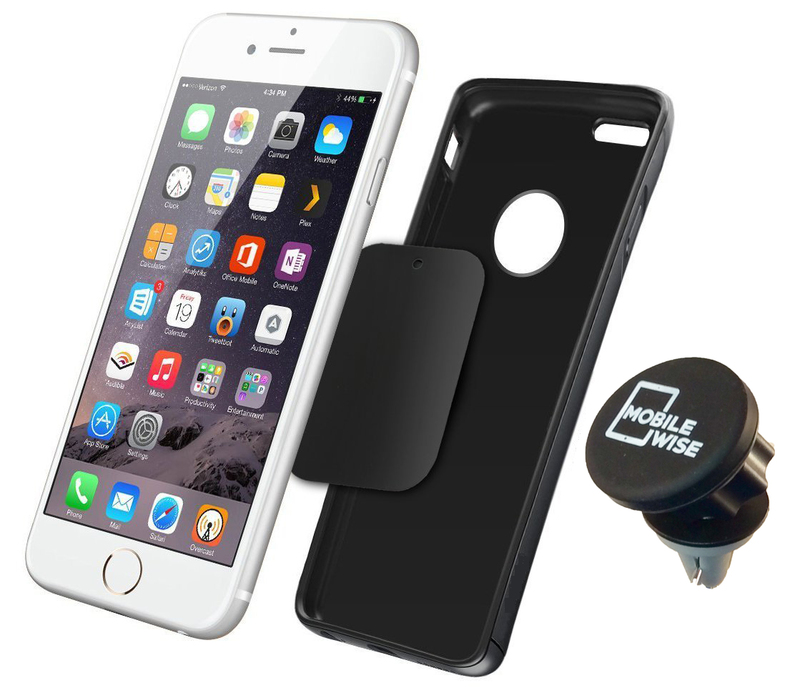 The Mobile wise magnetic mount comes with ultra-thin plates (provides grip for the magnet) which can be mounted on the back of your cell phone case or cell phone, without affecting the appearance of your phone. Besides this, you can also slide the plate between your phone and the phone case so that they aren't visible at all. Like so many people I get phone calls, or make phone calls when I'm driving. I have a 2004 Chrysler that isn't equipped with the high tech technology of the new cars that have cellphone service built right in, so a cellphone holder is my best option. I have a HTC Desire phone, and it is a larger phone, the same size as a iPhone 6 Plus. When this product arrived, the next day I decided to test it out on my way to work. I took off my cellphone cover, and inserted the metal piece that would stay between my phone and the case. I then tested to make sure that the magnetic piece worked with the actual holder before heading out to my car, and all was well. It seemed to have a strong hold, and everything was fine. I put the metal piece in the dead middle of my phone. I got out to my car, and I had the first problem. My air vents are the rolling kind, the whole vent can roll up or down. So I had to roll my vent all the way down so that it would stay. Once I got that all set, I put my phone onto the holder, and everything seemed fine. I started up a call, and backed out of my driveway. When I got to the end of my housing development road, I went to turn and take off, and my cellphone went flying down onto the floor. I pulled over, and picked up my phone, and attempted again. About a minute later, the same thing happened while I was driving straight down the road. Finally after 2 literally dropped calls, I gave up on using this device. The next day I went shopping with a family member who has a iPhone 5C, and I decided to try it out on her phone, in her 2014 Ford car. It worked better with her phone. I think this isn't quite a universal cellphone holder, it seems to do better with regular sized cellphones. If you have a larger one like mine, the iPhone 6 Plus, or any other phone that is similar to that, from my experience, this probably won't work for you.